My visitors came from *where* in July 2011?!?!? Happy August! Now that Arthur and I are more or less settled in here in DeBary, Florida, I hope to pick up the birding – and blogging – pace this month. It looks like local bird clubs will start up again in September and I hope I’ll have even more to share with my readers in the coming months. Migration is already underway. Birds await! Meanwhile, here is a short list of some of the more interesting search terms that brought visitors to this site during July 2011. This is part of an ongoing monthly series on blog search terms. 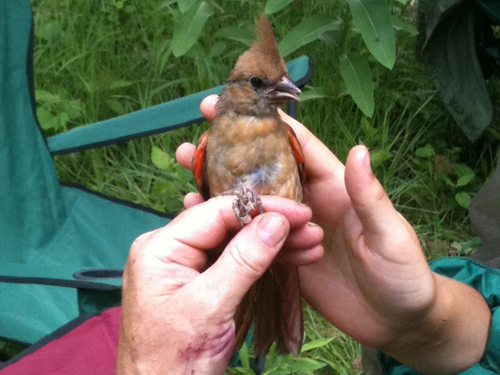 identifying baby cardinal vs cowbird… Really? For one thing, baby Northern Cardinals have crests, and cowbirds don’t. By the way, don’t search Flickr for photos of baby cowbirds – it’s kind of depressing (and I love cowbirds). what bird song sounds like T-shirt?… Do you perhaps mean what bird sings “teacher”? i need the official warblers shirt… I didn’t realize the Warblers went pro! describing the inside a parrot’s eye… Sounds like someone skipped lab this week? what is a black bird that swims with wings open and has yellow beak in Illinois… Double-crested Cormorant, maybe. teddybear like- birds… Oh, my. I really wonder what this person was seeking.